One example of the many common types of modern carports sold on the market. This particular one is a stand-alone model. A carport is a covered structure used to offer limited protection to vehicles, primarily cars, from rain and snow. The structure can either be free standing or attached to a wall. Unlike most structures, a carport does not have four walls, and usually has one or two. Carports offer less protection than garages but allow for more ventilation. In particular, a carport prevents frost on the windshield. A "mobile" and/or "enclosed" carport has the same purpose as a standard carport. However, it may be removed/relocated and is typically framed with tubular steel and may have canvas or vinyl type covering which encloses the complete frame, including walls. It may have an accessible front entry or open entryway not typically attached to any structure or fastened in place by permanent means put held in place by stakes. It is differentiated from a tent by its main purpose: to house vehicles and/or motorized equipment(a tent is to shelter people). 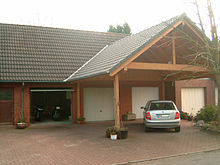 The term "carport" comes from the French term "porte-cochère", referring to a covered portal. Renowned architect Frank Lloyd Wright coined the term when he used a carport in the first of his "Usonian" home designs: the house of Herbert Jacobs, built in Madison, Wisconsin, in 1936. As early as 1909, carports were used by the Prairie School architect Walter Burley Griffin in his design for the Sloane House in Elmhurst, Illinois (Gebhard, 1991: 110). By 1913, carports were also being employed by other Prairie School architects such as the Minneapolis firm of Purcell, Feick & Elmslie in their design for a residence at Lockwood Lake, Wisconsin. In this instance, the carport was termed an "Auto Space" (Gebhard, 1991: 110). The late architectural historian David Gebhard suggested that the term "carport" originated from the feature’s use in 1930s Streamline Moderne residences (Gebhard, 1991: 107). This term, which entered popular jargon in 1939, stemmed from the visual connection between these streamlined residences and nautical imagery. In the 1930s through the 1950s, carports were also being used by Frank Lloyd Wright in his Usonian Houses, an idea that he may have gotten from Griffin, a former associate. The W. B. Sloane House in Elmhurst, Illinois, in 1910, is credited as being the first known home designed with a carport. In describing the carport to Mr. Jacob, architect Wright said, "A car is not a horse, and it doesn't need a barn." He then added, "Cars are built well enough now so that they do not require elaborate shelter." Cars prior to this time were not completely water tight; the era of robotic-assembly, advanced materials, and perfect closure lines was still 50 years in the future. The carport was therefore a cheap and effective device for protecting a car. Mr. Jacobs added: "Our cheap second-hand car had stood out all winter at the curb, often in weather far below zero (Fahrenheit). A carport was a downright luxury for it." Modern carports are typically made of metal (steel, tin, or aluminum) and are modular in style in the USA, while remaining flat-roofed permanent structures in much of the rest of the world. The carport is considered to be an economical method of protecting cars from the weather and sun damage. The metal carports in USA can be divided into Regular, Boxed-Eave, and Vertical roof styles. They differ in the sturdiness and how the roof panels are oriented. The carport and shadeport industry has modernized quite a lot over time. It is no longer just a roof covering for a car or vehicle but has extended itself to leisure uses such as awnings for a patio at home or a more modern designer shade sail. Look up carport in Wiktionary, the free dictionary. Wikimedia Commons has media related to Carports. ^ "Re: Why does your car windshield not frost over when parked under a carport?". www.madsci.org. Retrieved 2018-04-13. ^ "Frank Lloyd Wright - The Jacobs House 1936". www.usonia1.com. Retrieved 2018-04-13. ^ "Wayback Machine" (PDF). 2006-10-01. Retrieved 2018-04-13. ^ "Exterior view of W. B. Sloane House, Elmhurst, Illinois [picture]". nla.gov.au. Retrieved 2018-04-13. ^ "First floor plan of dwelling for Mr. W. B. Sloane residence, Elmhurst, Ilinois (sic)[picture]". nla.gov.au. Retrieved 2018-04-13.